What makes a salad eight hundred percent better? Say it with me. CHEEEEEESE. I figured this was the perfect recovery meal from the red, white and bluest weekend. You don’t detox with cheese? It’s a thing, I swear. We are in the thick of summer! Ooh ooh ooh I am loving it. I want to eat salads! Who would’ve thunk?! That is, I want to eat salads with all sorts of non-salady toppings. I can do the greens part, but then I would like a sprinkling of bacon, toasted almonds, onion strings, four cheeses, hard or soft boiled eggs (I don’t discriminate), tart dried cherries, grilled peach slices, hot bacon dressing and a drizzle of homemade buffalo ranch. A few weeks ago we had lunch at the Shoreby Club in Cleveland before my brother’s wedding. I opted for a strawberry, shrimp and goat cheese salad (omg) but the kale reggiano salad was another popular choice. It didn’t jump out at me because I was all “ew kale” – sort of have to be in the mood for that one – however, I didn’t realize that it was BABY kale! So much easier on the tastebuds and teeth. Baby kale I can totally do. All the time. Right?! Can’t you totally do baby kale?! 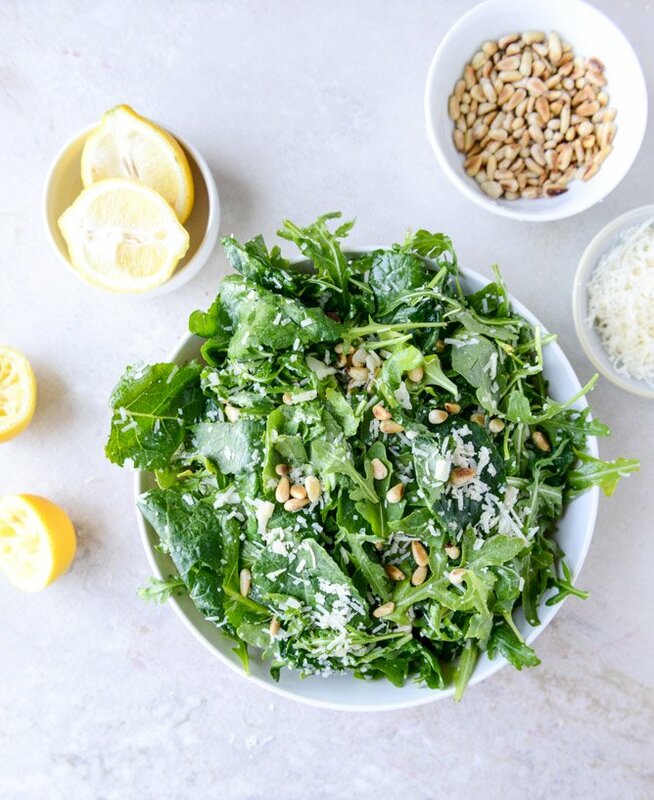 If you know someone who isn’t the biggest fan of kale, this is the salad for them. Not just because of the babiest of kales… but because of the cheese. So much freaking cheese. Who doesn’t want a little salad with their cheese? So. We’ve already established that there is lots of baby kale. Lots of cheese. Some arugula, given the title. As well as toasty pine nuts and a champagne vinaigrette. And at the very last minute, I threw on a sliced avocado and some fresh picked raspberries from my in-laws. You definitely don’t NEED the avocado and berries. 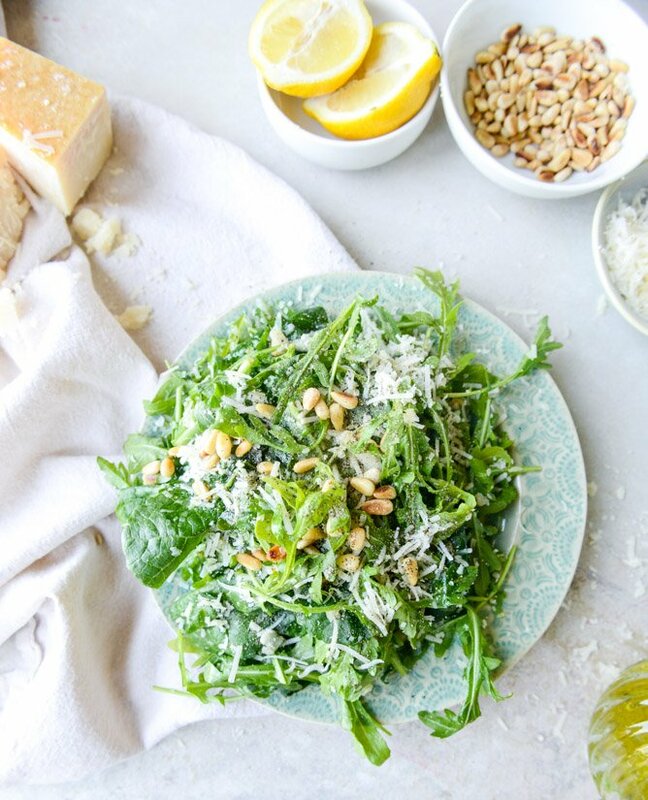 The salad along, just the greens, cheese and pine nuts makes for a perfect summer salad. It’s super light but filling and works before almost any dinner since it doesn’t have many offensive flavors. Do I always say this? I think I always say this. But it’s true! But if you want a fuller salad, go for the fruit! Or add in whatever kind of fruit you would like. It adds a leeeeeettle sweetness to the peppery arugula. If I can do it, you can do it. Trusssst me. Plus, since it’s Monday, there is sooooo much room left for a margarita. Don’t you love that? Place the greens in a large bowl and toss with the salt and white pepper. Add 2 tablespoons of the champagne vinaigrette to the greens and toss well until the all of the greens are coated – this will help the finely grated cheese stick. 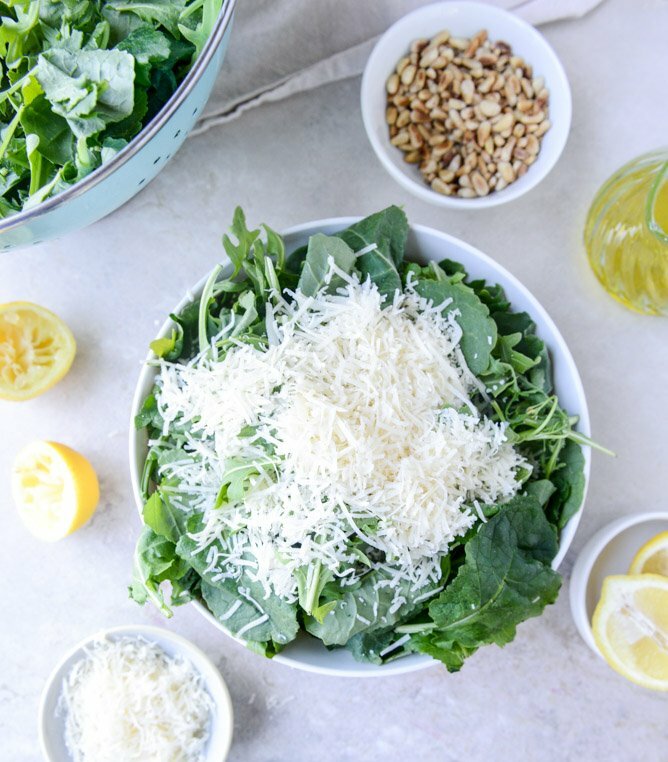 Add the cheese on the greens and toss well – toss over and over until the cheese is all incorporated. Toss in the oregano leaves. Serve the greens in heaping piles on plates and cover with a few spoonfuls of pine nuts. Add the dressing and toss gently on the plate. Top with avocado and raspberries and extra cheese. Season additionally if desired. Eat! Combine vinegar, honey, lemon juice, dijon, garlic, salt, pepper and red pepper in a large bowl and whisk together. Stream in the olive oil while constantly whisking until the dressing comes together. Store in the fridge for up to one week. And room for ice cream. Totally. Baby kale is a thing!?! How did I not know this. I pretend to have a secret love for kale, because I am a “healthy blogger” but, really, I have zero relationship with it. But cheese and this baby goodness? I NEED THIS. Pinned! Yep, cheese makes salad soooo much better. But so does avocado and berries and you’ve got them both!!! Loving this! Oh yum! I’m loving this salad idea, and that champagne vinaigrette? Perfection! This is seriously the ultimate salad for reals! Yum, this sounds absolutely perfect, especially with the addition of berries. Love this! 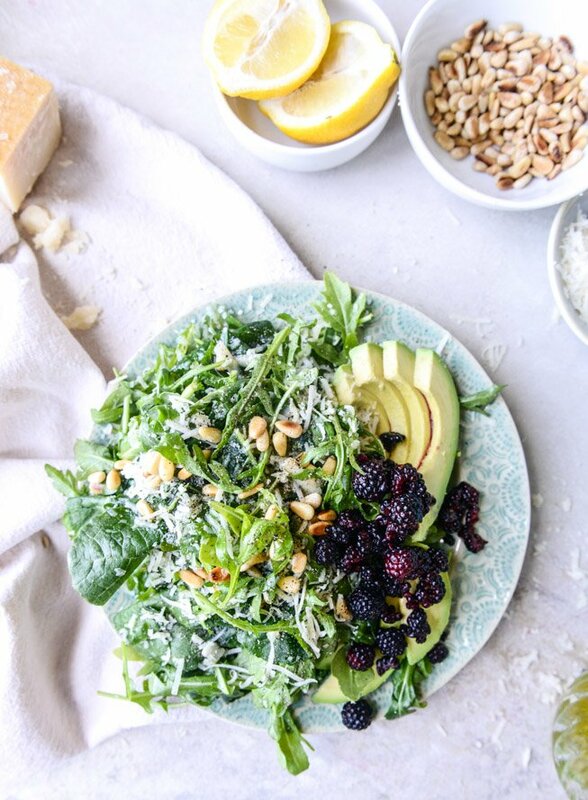 The pine nuts and berries and CHEESE totally compliment the greens. Yum. 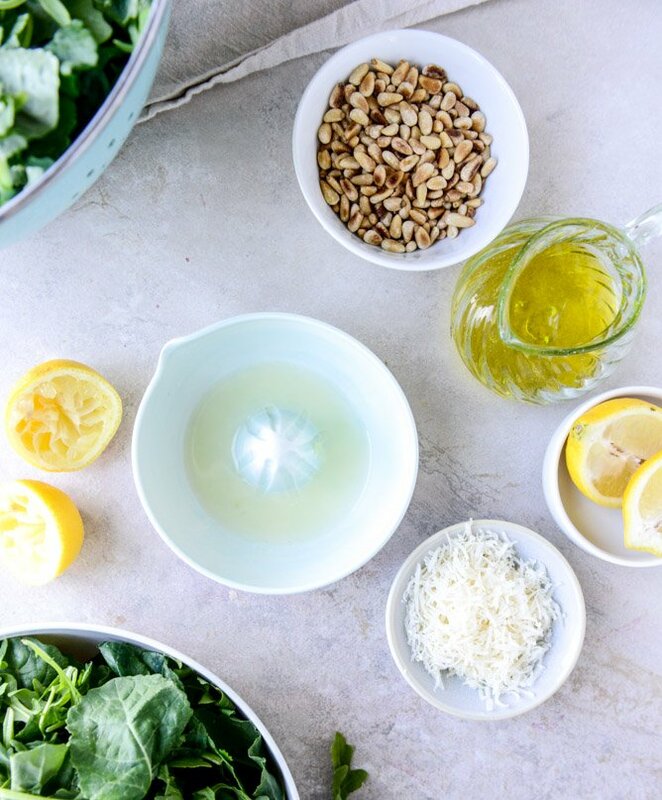 Cheese is necessary to any detox and this salad looks gorgeous!! I read that there’s 3 thing women can’t resist. 1 cheese 2 chocolate 3 bacon. But I think men are the same just add ice cream to the list. I’m making this tonight. Margaritas, too. Instead of detox I do hair of the dog. In salad I need to have cheese, red or green onion, and kalamata olives!! I love that I’m not the only one who loves non-salad toppings more than the salad itself. Cheese and croutons (and a really delish dressing) were the only reason I started eating salad in the first place! A could totally get down with a detox plan where we eat cheese all day. Sounds fabulous. This salad = gorgeous! 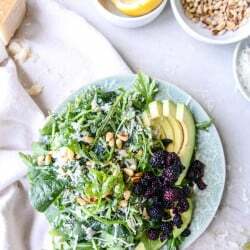 I started my detox with rosewater chiffon cake, but I can totally have this salad for dinner, love the kale, the fluffy cheese and the blackberries, all delicious and beautiful additions. Have a nice week. Yasss! Cheese makes everything better! I just recently made parmesan truffle fries on the blog and of course, it has a HEARTY serving of parmesan on the fries! Would be honored if you checked it out! This looks awesome! There’s no such thing as too much cheese. And where is the recipe for the buffalo ranch dressing? That sounds seriously good. Thanks for posting! Yum! This looks like an amazing salad! 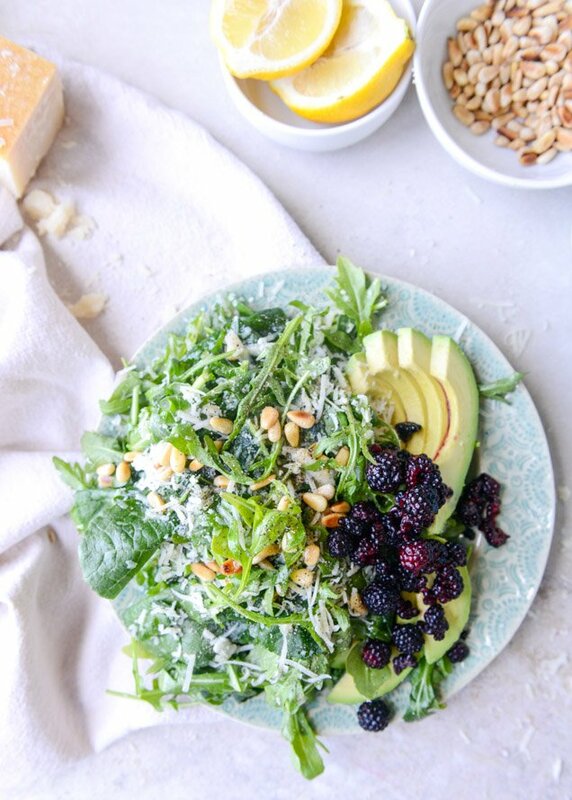 Cheese, avocados, and a good, homemade dressing definitely makes a salad a hundred times better! Ummm I didn’t even know baby kale was a thing! Also, I think my life is just one long cheese detox. Haha I can totally do baby kale. And I love cheese on my salads!! And everything else. It’s an addiction. Yes, I can totally do baby Kale! And I can eat this salad until I reach my desirable result- More! This looks so delicious! What a great summer salad! ohmy yes. this looks delicious! I’ve grown to absolutely LOVE arugula. This salad looks perfect. I’ll be happy to detox with you, Jessica! Yes, yes, yes… all things salad this time of year! The greens are so fresh and vibrant, I just love it! Your champagne vinaigrette is perfection! You had me at the word cheese! Ooo and pine nuts are awesome in a salad .Actually pine nuts are awesome in anything! Oh heck YES! Reggiano is my second favorite cheese (first is pecorino romano) but arugula AND kale (even the big parent kale), I’m in love with. Beautiful salad!!! I’ve been crazy over kale salads this summer, so far, so I’m all over this. Oh yeah, and it includes cheese. this salad looks soo yummyyy!! Ahhh! I want all of this. It looks so tasty. I’m pretty much a “baby kale only” kind of gal. Plus my husband would die if I told him it’s actually kale. This is totally MY kind of salad. I’d love a sliced nectarine on here. Yum! And…maybe some grilled flank steak?! Yes. This salad is SO SO good. Love it. My friends love it. And the Champagne vinaigrette is great with other salads as well.